As the Lok Sabha elections approach, the Congress candidate for the Haridwar seat, Harish Rawat, is going all out to bring about unity in the party. With the Women’s Reservation Bill still hanging fire due to the rigid stance by some political parties, women members of the Uttarakhand Congress have urged women to cast their votes for the Congress for its positive stance on the bill. For the first time, Bhartiya Janata Party (BJP) leaders today vented their anger against Munna Singh Chauhan, who recently resigned from the party as well as the post of legislator. Owing to his illness, the high-profile campaign that Uttarakhand Chief Minister BC Khanduri had launched for his Bharatiya Janata Party before the imposition of the Model Code of Conduct has lost momentum. The city was lashed by strong winds in the afternoon. The cloud cover and a short downpour afterwards brought down the temperature. As cotton is comfortable and most suitable for the Indian summer, it is in great demand this time too. In Dehradun, the wide range offered by various brands and in boutiques is attracting huge crowds. India celebrates number of harvesting festivals like Pongal, Bihu and Bashakhi. 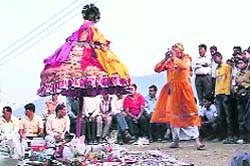 A similar festival is also celebrated in the Kumaon region here, especially in the eastern districts of Kumaon. Chaitola, a local festival celebrates the new crop. There seems to be no end to leopard attacks in Uttarakhand. The wildcats are showing a clear-cut tendency to move close to cities certainly hinting at the start of a dangerous trend. Perturbed over the lack of All-India Council of Technical Education (AICTE) affiliation to ICFAI University in Dehradun, students of the university today staged a massive demonstration at the District Magistrate’s office even while B.Tech students continued their dharna outside the university campus here. The police bust a vehicle-lifters gang by arresting two lifters with a stolen motorcycle, here today. A local advocate, Ramesh Kashyap, was defrauded by a youth while he was trying to withdraw money from an ATM counter at railway station, here yesterday. Morowala XI and Bad Boys team won their respective matches at the Kalanga Cricket Tournament, here yesterday. Delhi Dashers and Mumbai Matadors won their respective matches in the 2nd ONGC CMD Cricket Cup Tournament being played at the Abhimanyu Cricket . Orissa team cruised into the finals of the L H Youth T-20 Gold Cup Cricket Tournament underway at Matawalabag, here today. To add to this, many leaders from other parties are joining or re-joining the Congress. Barely days after three-time Member of Parliament Harpal Sathi joined the Congress terming it as homecoming, the party got another boost when expelled ward members and some former ones who had fought elections against the party’s official candidates re-joined the party. A major part is being played by Congress candidate Harish Rawat, who though being a new entrant for Haridwar, is banking on his political experience. He is going all out to unite Congress leaders and party workers so that there is no factionalism in the party which has been the norm for the past few elections in this seat. The expelled municipality ward members who joined the Congress recently are Ashok Sharma, Harish Sheri, Kripal Sharma, Pradeep Pant and Nand Kishor Arora. They have vowed to make the Congress strong and said that securing a record victory for the Congress is their prime focus. Harish Rawat has also succeeded in bringing party state vice-president Brahmaswaroop Brahmachari to his side. He has given Brahmachari the responsibility of managing the election campaign in the constituency. Both leaders had an hour-long private discussion a few days earlier after which Brahmachari accepted the responsibility of the Congress campaign. This is a major success for Rawat as Brahmaswaroop was also in the fray for party ticket and had a long brawl with Harish Rawat some time ago. Both rarely shared the dais at party functions. Former district chief of the Congress Vikas Chaudhary too has been re-inducted in the party after several rounds of talks with Harish Rawat, who was adamant on his induction. A section of the city Congress had objected to his re-induction initially but ultimately all agreed to it. Vikas Chaudhary along with his supporters has joined the Congress. “It is a homecoming. We have sorted out all differences. What happened is in the past and we are looking only to the party winning all five seats in Uttarakhand,” said an elated Chaudhary. State Congress chief Yashpal Arya has termed this as a sign of unity among Congress party workers and urged them to convert this opportunity to a win and end the 20-year drought in Haridwar constituency. While Haridwar seat incharge Vijay Saraswat said that a wave has been set off with the selection of a clean veteran candidate like Harish Rawat by the party high command. “The presence of Harish Rawat is making all the difference in Haridwar. The dissidents and old Congressmen are coming back to their home,” added Saraswat. “The public is quite upset with the BJP rule in the state. By electing candidates of the stature of Harish Rawat, Vijay Bahuguna, Satpal Maharaj, KC Bawa and Pradeep Tamta, the public will show its choice in the elections,” said state Congress vice-president Jot Singh Bisht. The Congress has been witnessing a dry spell in Haridwar. It was exactly two decades ago that Jagpal Singh won as a Congress candidate. In the last election, Dipak Kumar could only muster 76,001 votes and was placed fourth. Meanwhile, former Uttar Pradesh state home minister Ram Singh Saini who has resigned from the Bahujan Samaj Party (BSP) is all set to join the Congress. Padam Singh Saini, a popular Saini leader, had joined the Congress earlier this week. Ram Singh Saini enjoys a high political stature in the Haridwar district as he has been a legislator from Roorkee three time. He will definitely add to the Congress votes in the Roorkee belt and will pull several votes from Saini community which are very crucial for this seat. Addressing the workers, Uttarakhand Women Congress chief Shanti Juwatha said that women’s empowerment and self-reliance was the need of the hour. “Progress of women is essential for the development of India. “Only a few parties realise this. Otherwise, the bill would not have been hanging fire in Parliament,” said Shanti Juwatha. While recalling the contribution of women in every field, Poonam Bhagat, general secretary, Congress women cell, motivated women to come forward and participate in active politics. “From Indira Gandhi to Sonia Gandhi, women have shown that they are no less when it comes to politics and leading the country. If they can’t give us reservation, we should ourselves come forward, participate and contest in elections,” voiced general secretary Poonam Bhagat. 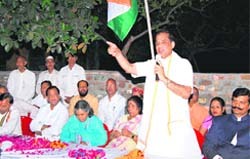 Briefing the gathering, city women Congress chief Anju Dwivedi said that the party was getting stronger in the state and particularly in Haridwar, where all members were working to ensure Congress candidate Harish Rawat’s win. Present at the meeting were veteran woman activists Ishwari Devi, secretary Vimla Pandey, Santosh Sharma, Rama, Kalawati, Veena, Krishna Pandey, Usha Sharma, Suman Aggarwal among others. Terming Munna as “irrelevant” to the party, BJP state spokesman Vishwas Dawar said that Munna was a “black sheep” and was only bothered about his own interest and had no concern for the people of his constituency who had made him an MLA. He claimed that Munna deliberately submitted his resignation to the Speaker on April 2 because the next four days were holidays. “Munna knew that his resignation cannot be accepted till Monday and during that period, the BJP will expel him. This would have enabled him to withdraw his resignation and he could have continued as a legislator because then, he would have not come under the purview of the anti-defection law,” he said. He added that Munna’s plan failed because the BJP did not expel him. While maintaining that the BJP had not received Munna’s resignation from the membership of the party, Vishwas Dawar said that taking cognisance of Munna’s activities, the BJP had suspended him from the party and proceedings for his expulsion were underway. Meanwhile, reacting to yesterday’s shoe-throwing incident, Dawar said that the Congress is trying to save its party leaders -Sajjan Kumar and Jagdish Tytler - who are accused in the 1984 anti-Sikh riots. “The Central Bureau of Investigation (CBI) has now become Congress Bureau of Investigation. If the NDA comes to power, we will bring the guilty to book,” he said. Dawar also accused the Congress of always suppressing the voice of the people who fight for their rights. “During the statehood agitation for Uttarakhand, the Congress tried its best to curb the agitation,” he alleged. Dawar also condemned the Uttar Pradesh government for booking Varun Gandhi under the National Security Act (NSA). “It was extremely unfortunate that Ajmal Kasab was not booked under the NSA whereas Varun had been charged under this Act”, he said. Flaying RJD chief Lalu Prasad Yadav for his comments on BJP leader Sushma Swaraj, Dawar said that such remarks show Lalu’s mentality and his cheap mindset. Talking about state issues, the BJP spokesman said that accusations levelled by Congress leaders regarding non-utilisation of central funds amounting to Rs 18,000 crore are completely false. “The state had not received even a single penny from the special package, as claimed by the Congress”, he said. Meanwhile, Uttarakhand Health Minister Dr Ramesh Pokhriyal Nishank has strongly condemned Lalu’s remarks against Varun Gandhi. “Lalu should be arrested immediately for the kind of language he used against Varun”, he demanded. This has caused considerable alarm in the party rank and file, especially when campaigning by other major rival parties is full steam. Partymen fear that the BJP may lose the edge that it had got with the Chief Minister touring the length and breadth of the state last month, announcing developmental schemes in all districts. The Chief Minister was taken ill suddenly and diagnosed with having multiple stones in his gall bladder. He was taken to New Delhi where he was operated upon at Apollo Hospital. After recuperating at his New Delhi residence, Khanduri returned to the state capital last week. He was expected to join campaigning without further loss of time, but much to the chagrin of party candidates, he was advised rest. The 76-year-old Khanduri was expected to attend a meeting of the party’s Scheduled Castes and Scheduled Tribes cell yesterday, but decided to skip it. “The Chief Minister will join the poll campaign on April 12,” Dr Devender Bhasin, a close BJP aide and chairman of the state’s media advisory committee said. “He is hale and hearty and attending closed-door party meetings to devise an election strategy in the state,” Bhasin added. Party leaders say the ruling BJP started a blitzkrieg lasst month with Khanduri visiting all districts in the state. “Since elections in the state are to be held in the last phase on May 13, senior party leaders, including the Chief Minister, will be pitching in in the first week of May,” Bhasin said. The sudden change in weather brought some respite from the scorching heat. It was a bright sunny day till around 2 pm when a cloud cover was seen in the heavens above. The strong dusty wind added to their woes of the commuters. At several places, people were seen looking for cover and women switched to sunglasses or were seen shielding their face with dupattas. At Ranipur area, traffic came to a halt for a while when a signboard of a shop fell on the road side. With the wind blowing at high speed, residents had to endure a power cut in the evening. Branches, twigs and leaves were scattered here and there. “This is quite unusual as every second day, the weather changes. For those who work in the field, it is quite tough,” said Deepak Dhiman, a marketing executive in SIDCUL. “In the morning, it was hot but now the dusty winds have made it impossible to stand outside,” said Shikha Bora, a computer professional at Ranipur Mod. The weather affected the election campaign as most party workers cancelled their outdoor work and preferred staying in party offices. Light showers with squall and hail is expected to take place in next 24 hours in Uttarakhand. Dr Anand Sharma, director, Dehradun Meteorological Department said light showers accompanied by squall and hail at isolated places will continue in the state for next 24 hours. However, he ruled out that the squall or hail would cause any major damage to the mango and litchi crops. “The sky would remain clear from April 10 to April 14 and thus they can work upon their fields during the period,” he added. For the past three-four years, a lot of variety has come up in cotton offering people options to look trendy and be comfortable. Fab India, a brand which specialises in ethnic wear, has gone beyond regular cotton kurtas and launched short and long ‘kurtas’ in malmal cotton with the famous ‘chikan’ work. “Kurtas with ‘chikan’ embroidery are our latest offering. They are in colours like creams and whites and are perfect to be worn with jeans and salwars. “And apart from cotton skirts, we have also come up with colourful crinkled knee-length skirts and wrap-arounds which are in demand by teenagers,” said Payal, head, garments section, Fab India. Another famous brand, ‘Cotton County’ of the Birla group, was launched in the city two years ago and its focus is completely on stylish cotton wear. Short and long kurtas are from Rs 595 onwards whereas t-shirts with catchy logos start at Rs 195. “For the past two years, the response in the city has been excellent. For this season, we have come up with ‘soothing’-coloured kurtas for both men and women. “We also have designer tunics which can be worn with denims or ankle-length tights,” said Amit, manager, Cotton County. In the month of April the villages of Pithoragarh district smear in a unique flavour of festivity of Chaitola, which is celebrated from 10th day (dashmi) onwards till the last day of the Shukla Paksha in the month of Chaitra. An umbrella shaped posture of the local deities is carved around a log decorated with the colourful scarfs. The umbrella, considered as a local deity or Bhumia Devta, is offered Harela leaves, which are considered to be sacred as per the rituals. The deity (umbrella) thereafter travels every village where the villagers pray for the protection for their Rabi crop and health of their livestock. As per the other ritual of the festival married girls get gifts from their parents and brothers. “This festival not only celebrates the love and affection between sisters and their brothers but is also celebrated to seek blessings of our local deity,” said Mohan Singh Rawat, a resident of Pithoragarh town. The peculiar thing about the Chaitola is that women prepare rice papad. Men folk are totally debarred from the entire process and these papads along with other preparation are gifted to village girls who offer these preparations to the local diety. In the villages of Sore valley, the local deity Devalsamet is worshipped and is carried out to travel all the 22 villages. Besides these, some other deities are also worshipped in diiferent parts of the district. Dr Ram Singh, a historian believes in the old times when there were tribal groups, the mother of the clan happened to be the head of the family. These mother goddesses were dominant in the entire Himalayan region and this festival reflects their influence in the region. The festival ends with the sound of Damau, a traditional drum, at the temple of the local deities. While it took seven hours for the Haldwani forest officials to capture a leopard that had entered the Haldwani city of Kumaon region, another child was taken away in the Badia-sem village of Garisen in Garhwal by a leopard. This comes at the time when inhabitants living in the periphery of Dehradun city have been seeking prompt action from the administration against leopard attacks. A five-year-old boy was taken away by the prowling leopard in the Badia-sem village on Tuesday. The victim, five-year-old Bhagat, was standing on the roof of his house when a leopard pounced upon the child and took him away before he could raise an alarm. A similar incident had taken place in the region on March 30 when a seven-year-old girl was injured. In the Haldwani incident, the wild cat had ventured into the city the previous day. The forest authorities had tough time trying to cage the leopard which had entered the thickly populated Lohriyasaal Talla area of Haldwani. After a seven-hour marathon, the leopard that had hid itself beneath a car was tranquilised but not before it had attacked over a dozen people inflicting serious injuries on them. The leopard had entered the Lohriyasaal Talla area of Haldwani that is adjacent to the boundary of the Corbett Tiger Reserve. It first attacked Deepak Pawar and labourer Jagan Lal, his wife Sundra Devi, who were working in wheat fields. This was followed by attack on few passers-by. After much commotion, the leopard was driven away from the fields and it took refuge beneath a car. Soon the Forest Department team led by Parag Madhukar Dhakate along with the local administration rushed to the scene of incident and after the operation that lasted around seven hours, they managed to tranquilise the wildcat. While leopard attacks have become more frequent this year in the hill village areas of the state, Dehradun is facing the aftershocks. A day earlier, residents led by Upendra Thapli of Jhanjhra area, which lies on the western periphery of Dehradun, had met the senior forest officials and the district magistrate seeking a respite for the villagers against a leopard on the prowl in the region. The inhabitants allege that a leopard had targeted a woman in the region who somehow managed to flee while scores of their livestock have been killed by this leopard. The inhabitants on the eastern side of Dehradun city had also expressed fears of leopard activity in the vicinity. Hardly a week earlier, some individuals at the Indian Institute of Petroleum had observed a leopard in the region and had sought prompt action on the part of forest authorities. WWF Uttarakhand head Dr Hem Singh Gehlot admitted to the rise in incidents of human-wildlife conflict. “With leopard habitat steadily shrinking, wildlife, particularly leopards, are coming into direct clash with humans,” said Dr Gehlot who demanded a comprehensive policy on part of the state wildlife authorities to deal with the problem. Interestingly, the State Forest Department has maintained a studied silence over these incidents. While resentment on part of the affected villagers has mounted and there is increasing pressure on conservationists to take measures to tame the beasts, the latter have been highly critical of such operations. The authorities are looking for a way out. As many as 850 B.Tech students of the university have been staging a dharna outside the premises for one week. A group of university students led by Jitender Rawat reached the DM’s office today and resorted to anti-ICFAI management sloganeering. The protesters held that as the university’s B.Tech course did not have AICTE affiliation, the future of the 850 students was in the dark. These students would find it difficult to get a job as their degree would be held invalid, the students said. They also alleged that the university was charging excessive fee for the course. The students will meet the DM tomorrow. On a tip off, the police laid a naka near Rampur post where the miscreants were nabbed while riding the Passion motorcycle. Three other vehicles were recovered from a nearby forest area. A total of four motorcycles; two Hero Honda Splendours (UP11N-9766 and another w/o number) and a Discover (UP114V-6488), Passion (UP11N-9996)-- and two knives have been recovered from Shadab and Mir Alam, both residents of Manglore. Ajay Joshi, SP (Rural) said during the interrogation, the miscreants confessed that they had stolen a total of six motorcycles. “They used to sell the bikes to a Muzzafrabad-based scrap dealer in parts. Raids are on to arrest the scrap dealer,” said Joshi. “We hope that more cases of vehicle thefts would be solved after the arrest of the scrap dealer,” added the SP. To boost the morale of the police, the SP has announced a cash reward of Rs 2,500 for the police team, led by inspector RK Chamoli. Kashyap alleged that a youth took away Rs 10,000 from his account on pretext of helping him out at the counter. The police said the advocate was offered help by a youth as Kashyap was facing some problem during the transaction process at the ATM counter. Today, when Kashyap checked his account at the bank he was told that a sum of Rs 10,000 was withdrawn from his account yesterday. The advocate then brought the matter to the notice of the police which initiated action under the relevant provisions of law. The first match took place between SGRR XI and Morowala XI. Batting first SGRR XI team scored 91 runs in 15 overs. Opening batsman Mohan gave a good start to the team. He scored 16 runs off 13 balls. Akash and Virender got out after making 2 runs each. Innings of Prashant and Rajesh gave the team some stability. Prashant made 17 runs and Rajesh made 16. For Morowala XI, Imran was the lead wicket taker with four wickets in 3 overs while Amir took two wickets. Chasing a target of 92 runs, Morowala XI reached the target with two wickets in hand and four balls remaining of the last over. Despite beginning on a low note, losing both its opening batsmen at the score of zero, Morowala XI came back strongly with Sudheer’s innings who hit an unbeaten 50 runs off 31 balls. Firoz hit 13 runs off 9 balls. For SGRR XI team, Prashant took four wickets while Rocky picked up two. In the second match of the day, Bad Boys XI team beat Eleven Wonders by 31 runs. Batting first, Bad Boys team was on to a fine start, as its openers gave their team a head start to contribute 23 runs within two overs. Rahul was the lead run getter for the team with 36 runs off 30 balls, smashing one four and three sixes. Second down batsman Harish further accelerated the run rate for the team hitting 28 runs off 21 balls. For Eleven Wonders team Arun was the pick of the bowlers with three wickets while Nitish took two wickets. Chasing a victory target of 126 runs, Eleven Wonders team was all out for 94 runs in 12 overs. Nitish was the top run getter for his team with 21 runs. For Bad Boys XI team Kapil, Anup Pal and Rahul took two wickets each. In the first match, Delhi Dashers defeated Doon Dynamos by 8 wickets. While batting first, Doon Dynamos were all out for 114 runs in 19 overs. Their top scorers were Ajit Kurian (40 runs) and Nadeem (21 runs). Balram Sharma and Tilak Raj took 3 wickets each for Delhi Dashers. Brilliant batting performance by Pradeep Jain (51) and Tilak Raj (24) helped Delhi Dashers to win the match. Delhi Dashers achieved the target in 18.1 overs. Tilak Raj was declared the Man of the Match for his all round performance. The second match played between Assam Aragons and Mumbai Matadors witnessed a nail-biting finish. Assam Aragons scored 149 at the loss of 4 wickets in 20 overs. Dipu Das scored 40 runs, Rajesh Bawa made 39 and N Das scored 34. Mumbai Matadors achieved the target at the loss of 3 wickets in 19.05 overs. Their top scorers were Ravi (83) and ND Maykar (19). Ravi was declared the Man of the Match for his superb match winning performance. In the semifinal match, Orissa defeated Uttar Pradesh by nine wickets. Uttar Pradesh team decided to bat first and piled up a modest total of 84 runs in allotted 20 overs. Mohit was the top scorer for the Uttar Pradesh team with 29 runs. Middle order batsman Raman made important 14 runs. For Orissa team’s Senghal took crucial three wickets. In reply, Orissa reached the target in just 12.3 overs. P Khan was the top scorer for the team with 17 runs and Irshad made 13 runs. In the quarterfinal match played between West Bengal and YMCA team, YMCA made it to the semifinals match after beating West Bengal.